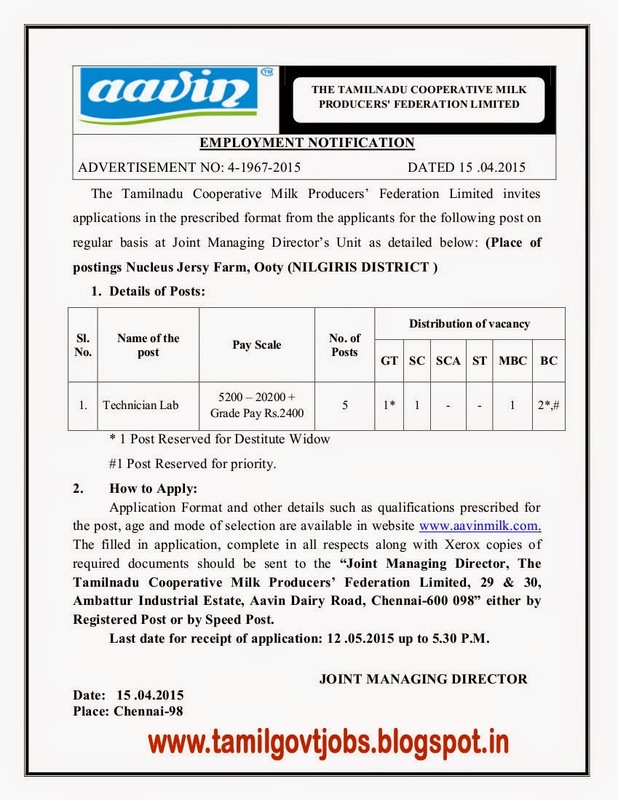 Aavin Nilgris Recruitments 2015 : Lab Technician Post in Tamilnadu Co-operative Milk Producers' Federation Ltd Chennai through direct recruitment process for Nucleus Jersy Farms, Ooty, The Nilgiris District. Technician (Lab) - 5 Posts (1 UR Widow ; 1 SC ; 1 MBC ; 1 BC General ; 1 BC Widow) - Basic Pay 5200 Grade Pay 2400 in Pay Band I category - 10th Std Pass with Diploma in Laboratory Technician. There is no application fee.Separate application should be send for each post.Selection by written test and interview. Place of Posting : Nucleus Jersy Farms, Ooty, The Nilgiris District Tamilnadu.